The “Nevertheless” is a connective word with the close of Chapter 8, and a contrast to the judicial darkness that is described there. God had and would provide a light if the rebellious nation would open its eyes to receive that light. Here again, the prophecy passes from the immediate invasion of Assyria to the shining light of the Incarnate Christ amidst the people, and especially to Galilee. 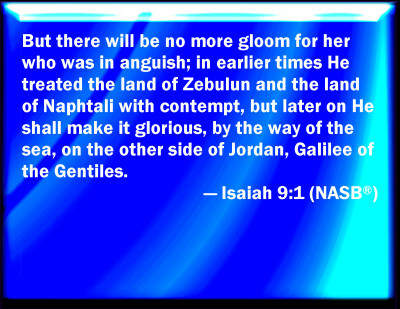 The district of Zebulon and Naphtali would suffer greatly from the invasion by Syria, and then again by Assyria It would be through the lands of these two tribes that the sweep of the conquering nations would come. It would seem that God treated that area with contempt. Yet, by contrast, those regions would be greatly blessed by the promise in the next verse.